As far as giant corporations go, it's usually Sony that's willing to a take risk on an unorthodox new product. 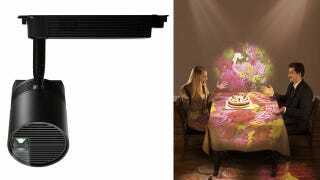 But this time it's Panasonic's turn with the company's new Space Player that combines overhead lighting with compact projectors letting you project everything from different colors, to still images, to videos and animation. It creates some great opportunities for unique lighting in the home. By projecting a design you'd never need to wash another table cloth again. And in lieu of wallpaper that's a nightmare to remove, you could simply project unique textures on your walls, and then tweak the colors to perfectly complement your decor. But where this will probably have the most useful applications is in retail. Using a bright laser with a lifetime of 20,000 hours as its light source, instead of LEDs, means they can be mounted high without having to factor in accessibility for bulb changes. And for projectors, laser light sources means you never have to futz with the focus. In addition to drawing attention to products on display using standard spot lights, the Space Player lights could also project additional information about a product around the display, and even use animations to catch a shopper's eye. In the long run it would be a far cheaper alternative to printed signage, even allowing prices to be updated in an instant. Videos and images can be loaded directly via an SD card or an HDMI cable, but you're also able to stream content to the lights over Wi-Fi which cuts down on the number of cables you have to route to a ceiling.